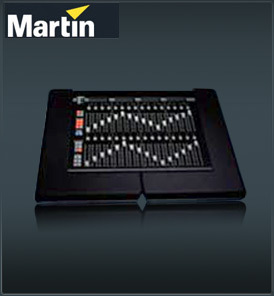 The Martin Case Playback Wing can be plug and play connected to any Case control desk for instant use. The ease of use and general flexibility of the Case Pro consoles are thus increased, making the Martin Case Pro I and II fitted with the Playback Wing a major advancement for the touring industry, fashion shows, festivals and everywhere a great amount of improvisation is a must. The extra number of playbacks eases the control of improvised and unstructured shows and can also be used in theatre, TV and production studios or larger shows for groups of conventional lights. Furthermore extra buttons for instant selection of special functions like Lamp ON/OFF and resetting bring even faster control in a live situation. For a rental house the Playback Wing provides the possibility to rent out exactly the right configuration for each specific gig.